While I have many paddles in my collection and each is unique in the sensations that they generate this is the first wooden or bamboo one I have owned. I was curious as to how it would feel from both ends of the handle. The Bamboo Spanking Paddle comes in a no-frills simple, clear pouch. It has a Bound To Tease label attached to a paracord loop that goes through the handle. Measuring in at 42cm/16.5" long, it has a handle that is 15cm/5.9" long. The handle is lovely and straightforward featuring a crisp design. The end of it features an almost heart shape section that is merged with the handle, and this looks very nice indeed. The business end of the paddle is 27cm/10.6" x 10.5cm/4.1" wide. This makes for a large area that is capable of striking both buttocks at the same time with stingy, yelpy results. You can put your wrist through the paracord loop on the handle if you are worried about slippery fingers not being able to grip the smooth handle. Or, you can just use the loop to hang the paddle up between uses. The thing that I like most about this paddle is it looks. The smooth surface with it grain locked inside the glossy varnish looks fantastic. I could spend a lot of time just staring at it intimately, noting the details of the grain and knots. I also love the dichotomy of its warm, welcoming looks and its harsh, painful impacts. The bamboo in this paddle just doesn't yield at all, and it is easy to swing. That ease of use belies an ability to delivery very hard strokes swiftly and efficiently. This is a paddle eminently suitable for advanced and intermediate users. But, beginners can use it with caution and lots of care as it is capable of inflicting lots of pain. It is very suited for close environments where it can be difficult to swing a flogger or whip. It also lends itself to over the knee paddling sessions or in conjunction with a spanking bench. This paddle delivers deep thuddy impacts that sting like hell. Even slow, short swings provide deliciously sharp painful impacts that quickly draw the blood to the surface of your skin. It is effortless to get a pair of buttocks bright red in no time at all with this paddle. It is the fact that it is so solid with no give at all that makes it such a severe implement. The impact while spread over a wide area is crisp and heavy. These impacts result in a sharp intake of breath and a deep stinging sensation all around the area of impact. It really is a delight to use. Using it on sub'r' is a delight and she loves the sensations that it delivers. Stroke after stroke gets her all excited and slowly building up the strength of the blows has her gasping and her backside actively pushing back against the paddle as she gets more and more aroused. I was delighted by how much sub'r' loves this style of impact and it is now a staple feature of our impact play. I shouldn't really be surprised as she loves the Cat as well. We found that the best way to use this paddle is to warm up first with a flogger or just your hands until the flesh is red and hot to the touch. Then we switch to the bamboo paddle for some harder play. This quickly gets the adrenalin and endorphins flowing and sub'r' quickly goes into subspace, enjoying the sensations being delivered. But, this is a paddle that any submissive could quickly learn to fear if used improperly or too harshly. After lots of use sub'r' relishes the thuddy impacts and it arouses her every time we use it. The impacts are felt long after the paddle is removed and this is the sign of a profoundly deep impact, and it feels lovely. 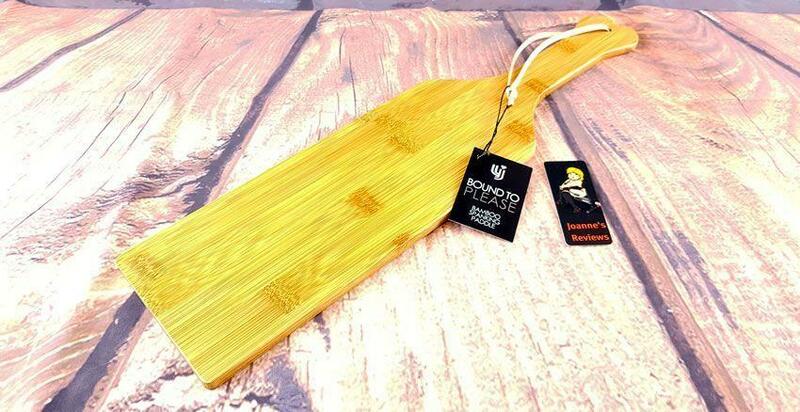 The Bound To Tease Bamboo Spanking Paddle is fantastic quality and definitely made to last. Its thick profile gives it a nice weight and rigidity. It is fast becoming one of my favourite paddles. It will definitely be getting lots more use on sub'r', and Joanne also enjoys its ministrations. If you are looking for a paddle that can really expand your play sessions, one capable of delivering delicious impacts to both buttocks at the same time then check this one out. For its meagre £12.95 price tag you will get a fantastic impact play toy that will take pride of place in your collection. You get one of these fantastic paddles from sextoys.co.uk, I'd like to thank them once again for allowing me to review this for them. Grab one of these fantastic Bound To Tease Bamboo Paddles from sextoys.co.uk for only £12.95 which is fantastic value for money. 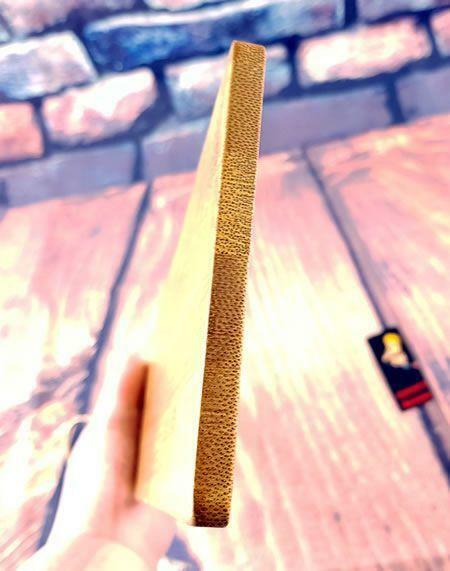 Disclaimer - I was sent the Bound To Tease Bamboo Paddle to review free of charge and this has in no way affected the outcome of this review. This post contains affiliate links and if you purchase something when you follow one of these links I may receive a small commission at no cost to you. For more information check out my disclosure page.